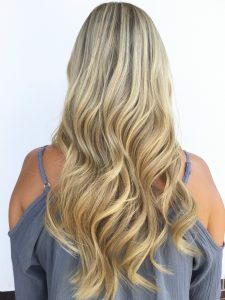 As for the coloring technique, Balayage is best for brunettes transitioning to blonde hair. It’s a fun way to change your look and add those icy pieces throughout your locks. After the initial balayage treatment, you’ll need to return to your salon every six to eight weeks for additional treatment around the face and on the underneath side of your hair. Additionally, you’ll probably want an update to the shine glossing to maintain that gorgeous blonde look. It’s a really beautiful technique because it’s so low. Balayage is more complicated than it looks. It takes a real artist to successfully transition you to a balayage blonde!